Photosynthetic green bacteria (Chlorobiaceae) employ large, light-harvesting antennae called chlorosomes. Antennae always contain chromophores such as chlorophylls, bacteriochlorophylls, linear tetrapyrroles, or carotenoids. The chlorosome is unusual in that its antenna pigment, bacteriochlorophyll c (BChl c) is found only in photosynthetic green bacteria. BChl c (str) is unique in having methyl groups in the C-82, C-121, and C-20 positions, substitutions that are not found in other chlorophyll families. Further, BChl c is not organized on a protein scaffold but is self-organized, forming form large molecular aggregates independent of a protein scaffold. Light first impinges upon cylindrical aggregates of Bchl c and carotenoids (1) within, the chlorosome unit (3), sitting atop a Bchl baseplate (2), which abuts with the antenna proteins (5) and the reaction center (6) within the cytoplasmic membrane(4). "Chlorosomes of green bacteria are unique antenna systems amongst photosynthetic organisms since their light harvesting pigments are organized without proteins. Rather, the light harvesting bacteriochlorophylls (BChl) are self-organized by extensive networks of hydrogen and coordinative bonding, and by p-p interactions thus building large supramolecular aggregates containing many thousands of BChls per complex. Using electron microscopy rod structures composed of these aggregates had been resolved. All these molecules also form highly ordered one- and two-dimensional arrays, depending on the formation conditions, on surfaces." [ref & image] Compare to model. BChl c biosynthesis probably evolved (path) from BChl a biosynthesis in that all enzymes identified as are specific for BChl c biosynthesis (except BchU*) appear to have been generated by duplication of genes involved in BChl a and Chl a biosynthesis. (proposed biosynthetic pathway.) Further support for the primacy of BChl a lies in the observation Chl a and BChl a and their derivatives function both as antenna pigments and as essential electron transfer cofactors in the reaction center, while BChl c functions only as an antenna pigment in chlorosomes. 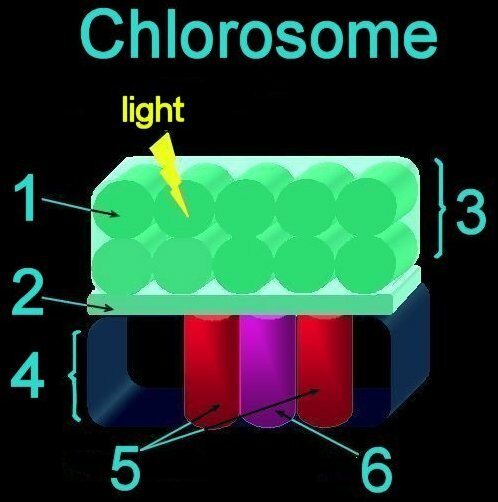 Biophysical Journal: Lamellar Organization of Pigments in Chlorosomes, the Light Harvesting Complexes of Green Photosynthetic Bacteria: "Chlorosomes of green photosynthetic bacteria constitute the most efficient light harvesting complexes found in nature. In addition, the chlorosome is the only known photosynthetic system where the majority of pigments (BChl) is not organized in pigment-protein complexes but instead is assembled into aggregates. Because of the unusual organization, the chlorosome structure has not been resolved and only models, in which BChl pigments were organized into large rods, were proposed on the basis of freeze-fracture electron microscopy and spectroscopic constraints. We have obtained the first high-resolution images of chlorosomes from the green sulfur bacterium Chlorobium tepidum by cryoelectron microscopy. Cryoelectron microscopy images revealed dense striations ~20 [Angstrom] apart. X-ray scattering from chlorosomes exhibited a feature with the same ~20 [Angstrom] spacing. No evidence for the rod models was obtained. The observed spacing and tilt-series cryoelectron microscopy projections are compatible with a lamellar model, in which BChI molecules aggregate into semicrystalline lateral arrays. The diffraction data further indicate that arrays are built from BChI dimers. The arrays form undulating lamellae, which, in turn, are held together by interdigitated esterifying alcohol tails, carotenoids, and lipids. The lamellar model is consistent with earlier spectroscopic data and provides insight into chlorosome self-assembly." Saga Y, Wazawa T, Mizoguchi T, Ishii Y, Yanagida T, Tamiaki H. Spectral heterogeneity in single light-harvesting chlorosomes from green sulfur photosynthetic bacterium chlorobium tepidum. Photochem Photobiol. 2002 Apr;75(4):433-6. Gerola PD, Olson JM A new bacteriochlorophyll a-protein complex associated with chlorosomes of green sulfur bacteria. Biochim Biophys Acta. 1986 Jan 28;848(1):69-76.